As languages know many dialects and evolutions, there is a large variety of explanations (e.g. dialect German Werlein = a small dike, Werli= diminutive of Werner, Werl = grasshopper, Werle= gadfly, Werlin = a face with a tumor). I prefer the following more romantic version: In the 9th century the Emperor Charles the Great persecuted not christianised Germanics. Documents written in the year 802 named their hidden resistance camps CASTRUM WERLENSE. LEN = Germanic also LEH, LOH or LAON = Holy grove (Hain) or meadow = Mystic places of positive power, generally near to an environment with an evil aura (swamps, sinister woods, timberlines and rocks). E.g. OS-LO = Odins holy meadow. WER-LO / WER-LEN = Man or men at holy meadow or grove. From this origins we know places like WERLE, WERLEBURG, WARLO, WERLAON etc. / And from the same origin medioval first names WERLI, WERLE, WERLIN and others. 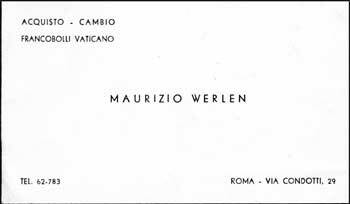 We will never know, if the origin of a familyname Werlen was the first name of an ancestor or if an ancestor had a link to the mentioned places. Before the 18th century the present Werlen were mentioned in documents also with the names WERLI, WERNLIN, WERENLIN, WERLE, WERLO and WERLA. Before the 17th century the name Werli was dominant. The family name WERLEN appears for the first time written in a document in 1313. The document ist mentioning "three sons of the WERLEN brothers". They were alpine settlers in the valley of Laterns (Austria) and they came from Switzerland (from the Goms valley). Currently there are worldwide only about 900 WERLEN. Estimated 600 in Switzerland, 200 in Argentina, 40 in Italy and 60 in other countries (Germany, USA, Great Britain, France and others). WERLE, WEHRLE, WEHRLI, WERLI, WEHRLI, WARLE, WARLO, WERLIN, WERLINDE, WERLINE, WERLIG, WERLINGER, WERLINICH, WERLINICK, WERLINK, WERLINKSY, WERLISBAKER, WERLIUS, WERLITZ, WERLITZER, WERLA, WERLLA, WERLER, WERLLER, WERLIST, WERLMAN, WERLEMANN, WERLIK, WERLOCK, VERL, VERLA, VERLE, VERLI, VERLIN, VERLAINE and VARLO. Be aware that sometimes Verl/Werl-Names can have also an other origine. E.G. Verli as abbreviation of the name Verlinden. VERLAYNE, VERLEAN, VERLE, VERLEAN, VERLEANA, VERLET, VERLETTA, VERLI, VERLICIA, VERLIN and VERLINA. The majority of the present Werl/Verl places derivate their name from the name of their founder or owner. E.g. Wehrlingen, Werlingen, Werligen, Zen Werligen = places in southern Germany and Switzerland foundet between the 6th and 9th century by Allemanic clan chiefs bearing a Werl name.